The flash player segment is a relatively crowded market, with many products, from a variety of manufacturers. Apple’s offering is the minimalistic iPod Shuffle, with no display and a minimal feature set. The iPod Shuffle has no FM radio, plays only MP3 and AAC files, and has no recording capability. Other companies are building feature rich electronic, all in one, “Leatherman” audio devices. I had the opportunity to test two of the latest feature-rich offerings. They are JetAudio’s iAudio 5, and Lexar’s LDP-600. Both support a variety of music formats, record voice, and have built in FM radios. In direct opposition to the iPod Shuffle, they both have displays with multiple colors. While each does cost more than a Shuffle with the same capacity, let’s see what the extra bucks buy, and if it’s worth it. Battery life was tested with Duracell alkaline, disposable batteries. A standard collection of music files was used including MP3’s (constant and variable bit rate files), WMA’s, OGG’s, and AAC files. Multiple styles of music were listened to including rock, classical, jazz, and soundtracks. These music files were played back through (1) the included earbuds, (2) a pair of Sony headphones, (3) an Altec Lansing 4.1 computer speaker system plugged directly into the player, and (4) a 180 watt, 6 speaker car stereo via a cassette adaptor. This was done to experience what the player was capable of across a variety of situations and file types. All the impressions about audio quality are subjective. However, I do have some background in music. My qualifications include perfect pitch, formal training in voice and saxophone, and am a self taught guitar player (acoustic and electric). In addition, I listen to a wide variety of music on a daily basis. The sound quality is very good. There are preset equalizer settings for live, rock, normal, classical, extra bass, pop and user selectable with 5 bands worth of settings. I am confident most users will be able to fine tune it to their taste. I like the user selectable with the top and bottom boosted to remedy the deficits found in compressed music. The included ear buds are comfortable, and have good sound quality. They would be adequate for non-audiophiles with good treble and bass. “Spinal Tap” devotees who listen to their music at a setting of 11 must look elsewhere. Even with the volume on the max, the sound was loud, but much less than rock concert loud. The iAudio 5 was definitely louder when pushed to the max. 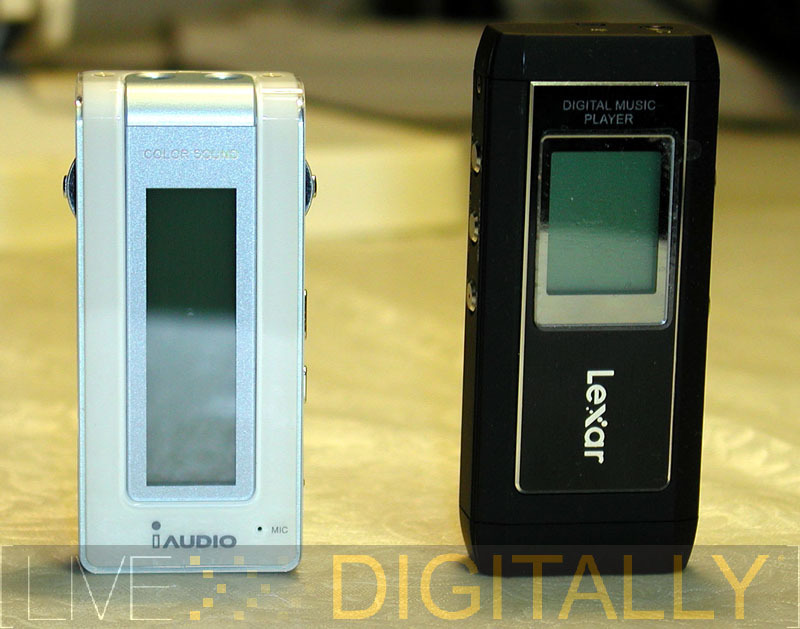 The Lexar LDP-600 has some stand out features such as the FM transmitter, lithium battery, and the SD card slot. The display is very readable in the right color. Unfortunately, the USB 1.1 connection, the need for USB to charge the battery, and clunky menu interface hampers this player. With so many features found in each player, many will be enticed to one or the other. It’s a shame we can’t buy one player with the entire set of stand out features in one device. The standout features of the iAudio 5 are its display and broad file format support. The LDP-600 is notable for its FM transmitting capabilities and SD card support. The consumer will have to decide which of these features are worth the premium over the minimalistic iPod Shuffle. Personally, I think they are worth it, and would never consider a music player without a display of some sort. Even with each music player’s shortcomings, they have enough extra features to keep users listening to what really matters: the music.